Thanks to Nadeem Farooq Paracha's blog in Dawn, we have the first acknowledgement from a Pakistani news organization about our role in exposing the fake Wikileaks (FakiLeaks?) story carried by many publications in the country. As of this writing, The News and the Express Tribune have both published retractions, though the far more widely circulated Jang and the Majeed Nizami mouthpieces, The Nation and Nawai Waqt have not (The Nation even went ahead and wrote an editorial basing itself on the Fakileaks, which has now been altered by apparently Indian hackers.) I am not sure if the Urdu daily Express and the Business Recorder, which also published the stories, have published retractions. On Dec 9th 2010 a news item attributed to our organization was published in some English Newspapers and Urdu Papers with regards to WikiLeaks disclosures regarding Indian Interference in Balochistan and Waziristan, Indian army and Israel. We had lifted this news by searching various search engines as part of regular scanning process for finding news about WikiLeaks disclosures, which has become a hot topic of every newspaper. On Dec 10 some of English and Urdu newspapers had criticized us of the report not being accurate and some of them even went to the extent of accusing us of wrong use of WikiLeaks documents for propaganda purposesand we had released a planted news item. While the truth is just the opposite if anyone goes on Goggle and writes: Wikileaks Leak About India, Israel And Afghanistan one would be able to get the same news we got. We are also attaching the news which we downloaded from the Internet so that the matter is clarified. One more thing we like to mention is that we had not received any notice or written compliant from WikiLeaks spokesman. The only mistake on our part was that we had not mentioned the link or source of the news for which we apologies. I hope you would publish our point of view as well in your esteemed newspapers. This 'clarification' does clarify many things about Online. The first and foremost conclusion that news organizations should draw from it is to run as far away from this wire agency as they can. This is how they gather their news??? By "lifting" (their words) stuff from Google??? The defence that "if anyone goes on Goggle [sic] and writes: Wikileaks Leaks About India, Israel and Afghanisan" one would be able to get the same news we got" would be uproariously funny were it not simultaneously so appalling. That's your defence Online??? So tomorrow, if you go on the net and search for "Conspiracy Theories About Moon Landing Being Fake", you would pass that along to news organizations as valid news? Second point: why exactly then do news organizations need you? I mean all they need to do to get their 'news' is Google (or Goggle, if that's your thing), right? Of course none of this takes away from the news organizations' own responsibilities to verify stories they take on. Are we to gather from this that the news sense of the staff at these papers and channels has deteriorated to such an extent that NONE of them saw anything remotely strange about the story? The News has announced that it will not pay Online its subscription for the month as punishment for making it into a laughing stock. Whoop de whoop. The 'clarification' of Online, one would have thought, should have been reason enough to immediately terminate any relationship. Jang did in fact run a retraction at the same time as The News, and also ran a follow-up about its notice to Online today. The retraction was on the front page and the follow-up on the back page, nowhere as prominent as the original stories, but still. Our apologies to Jang for missing the items and misstating its position. Also, Omar R. Qureshi in his blog in Express Tribune on December 9 did in fact mention Cafe Pyala as having commented on the story, though he did not exactly acknowledge the fact that we were the first within Pakistan and abroad to actually raise the issue of the fake cables. According to this blog, the editor of Online, Siddique Sajid (who wrote the above letter to news organizations), has resigned over the affair. We do not have independent confirmation of this. Decision made after Editor found solely responsible for making a fabricated story. "The enquiry was ordered and led by Mohsin J Baig, the Editor-in-Chief of Online, soon upon his return from Turkey, where he had accompanied Prime Minister Yousaf Raza Gillani during his official visit there. The decision to sack Mr. Siddique Sajid was made after it was established in the enquiry that he had ‘solely misused’ his editorial authority in the absence of the news agency’s Editor-in-Chief by ‘fabricating a false story’ on a highly sensitive subject such as the WikiLeaks’ disclosure. The Online Management regrets the release of the said story by Online, its subsequent publication by media, and the consequent erosion of their public credibility. It assures the subscribers and readers of the news service that stringent measures are being adopted to prevent vested interests from planting such fabricated stories. The Online International News Network is Pakistan’s largest news agency, with well over a decade long track-record of fair and balanced reporting, both news and photos, from Pakistan, the region and across the world. ‘We shall continue to perform this useful role in a responsible way as we have always done,’ said Mohsin J Baig, the Editor-in-Chief. ’I know the difficulty of reporting in a place laced with vested interests operating clandestinely, but reporting on currently the most volatile subject in global media and, that also, without corroborating the story’s contents with factual documents is unacceptable,’ Mr. Baig added, while justifying the sacking of the Editor Online." Well done Dawn. Btw, The NFP piece is not a blog, it's a featured article. It is weird how jang and nawa-e-waqt simply refuse to render an apology. Even though the leaks were obviously fake, the fact that the urdu newspapers did not retract the story and the talk shows have already aired the "revelations", the damage has already been done. I read somewhere that someone had commented that the leaks were indeed true, and its only Zionist Raw pressure that has forced the papers to retract their stories. Either some people are really desperate, as they face a losing propaganda war, or this just highlights many of our own biases where some of us really badly want to hold fiction as the truth. Dont remember exact words. Will see if I can find that newspaper and let you guys know. Do you think that this global(ish) attention that might be being drawn to the most right wing factions of our media, might lead to the entire world (or those parts that deal with South Asia) to basically pinpoint the right wing Urdu press as a propaganda source that can't be trusted? I mean, now it's on the internet and with Declan Walsh and the Guardian reporting on Jang and Nawa-e-Waqt's behaviour, if they don't issue some retraction, or show some contrition, the entire world will mentally right off those newspapers into the same trash heap The Nation has fallen into, after it threatened that reporter last year? Also notice how nobody seems to be caring that the Indo-Pak cyberwar seems to be raging, and nobody especially cares that a major Pakistani newspaper has been hacked? Last night I got to see Mr. Hamid Mir attributing the faked leaks to ESTABLISHMENT on an Indian channel Times Now, the host clearly was biased but watch out for how miserably Hamid Mir fails to get his point in..........err English. Watch it if you have the guts. Opps here is the link "http://www.timesnow.tv/videoshow/4360259.cms"
As one Ultah Seeda mention's, Piracha's piece is an article and not a blog. Makes a huge difference if a major newspaper puts up a 'featured article' rather than a blog. Why did intelligence agencies plant propaganda about something that is so easily verifiable? If a news item is to be planted, it shouldn't quote verifiable sources and have enough fact and fiction intermixed to give it a semblance of reality. The fake wikileaks was as best amateurish and a mischievous act by someone in the lower cadre in the intelligence agencies looking to please the higher-ups. Wah Wah , Cafe Pyala ; Wah Wah. Congratulations on a job very well done. Yes you guys were the first to blow the lid off the the fake wiki leaks story. Once again , Congratulations ; Keep up the good work. As for the Pakistani Media that ran the made up stories , I believe the correct expression is "Egg on the face"
I checked again. It is NOT a blog, my friend. But that's besides the point. Two things: It's Dawn who mentioned Pyala and it was written by NFP. I am so surprised that the right wing elements of Pakistan have not said that the story was planted by Indian spy agencies determined to make Pakistani journalists and news organizations stupid :-). If people are credulous enough to believe the original story, I think they will be willing to believe this too. I recently stumbled across your blog though the Guardian link and really like your analysis and writing on various topics. What does Declan Walsh have to say? Did he pick it from CP or verified on his own that leaks were fake? Ok, so it isn't really a retraction, Jang has translated first six paras of the Guardian story ( ends at: It suggests this is the first case of WikiLeaks being exploited for propaganda purposes.) and then cited online for being responsible for the story. Reads like they are running the "Guardian's side of the story"!! without any comments. It is printed on front page December 10, column one. Hard to classify what it is, a half hearted admission may be. I think that is as close to an open retraction as Jang can come for running a screaming lead story a day before. Come on, Omar, give it a break. Pyala got recocgnition from The Guardian and now Dawn and NFP. Pyala ppl deserve the praise especially when it is coming from well-known papers and columnists. Let's stick to the job at hand. There's a war to be fought with all the bigots and sell-outs in the local media. 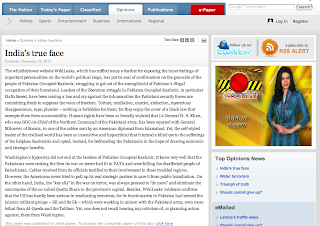 Blogs like Pyala and columnists like NFP, Irfan Hussain, Kamran Shafi and Fasi Zaka are on the frontline. And I am sure so are you. We're all in this togather, bro. Okay, so you were the first. Good for you. Still no apology from The nation and Nawa Waqat. Amazing. This isn’t just about whether or not the media is reliable – it’s about whether or not the media is intentionally or unintentionally sabotaging our national security. In any other country that claims to view journalism as a serious institution, a scandal of this magnitude would result in massive sackings. It will be instructive to see whether or not Mir Shakil-ur-Rahman has the courage and the principles to clean house. Because let’s face it. Jang Group is humiliated today, as is the entire nation. But if Mir Shakil-ur-Rahman doesn’t care about how his company and his nation look in the eyes of the rest of the world, he doesn’t have to do a thing. The people who read and believe this crap don’t read The Guardian, even if they do read English, so they likely don’t even know about the situation. No matter what Jang decides to do internally, though, the courts should immediately begin an inquiry into this mess. Seriously, if there was ever a cause worthy of suo moto notice, is this not it? How can the FO expect India to be cooperative while Jang is running defamatory articles about them? We want the Americans to treat us with respect while Ansar Abbasi is on TV telling Moeed Pirzada that all this WikiLeaks stuff is a big American conspiracy and saying that there are no boundaries to the ruthlessness and carelessness of Americans. Where is Mir Shakil-ur-Rahman while all of this is happening? If Jang Group wants to be a joke, that’s fine. They can continue selling all the fictions they want. But when they start publishing crap that undercuts the ability of government and military officials to do their jobs, that is where we need to draw the line. I strongly believe in a free media. And I strongly defend the right – even the responsibility – of the media to hold the government accountable. But I do NOT support the right for anyone in the media to SABOTAGE the government. Pakistan ki khair hay, bhai! 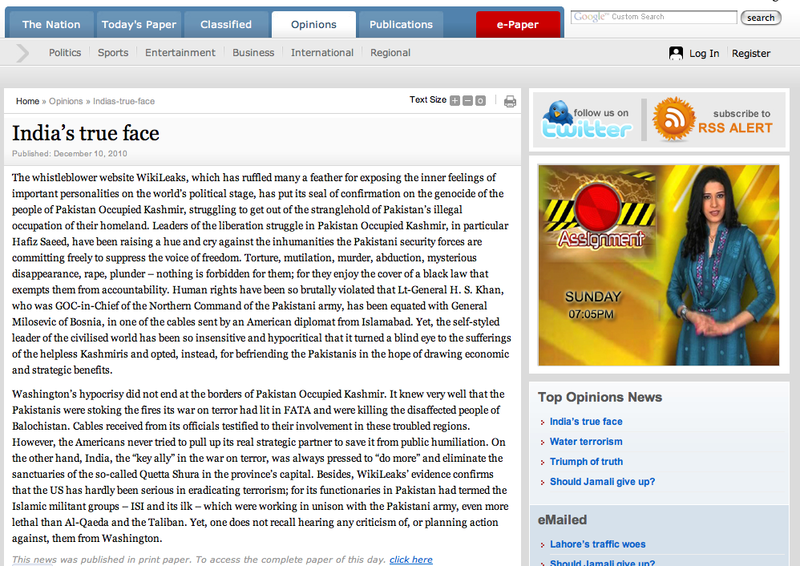 hehehee kon hay bhai who schizo dawn ex-sub-editor? But the Daily mail who published the stories is far from apologetic.......Instead they are tying to validate their news by telling readers ,how The nation & The news bowed to their indian stakeholders!!!!!!! read the letter that was published today in the express tribune that was written by ahmed quraishi in response to fasi zaka's piece. we must also take into account the credentials of one named as Mohsin Baig who happens to be the chief editor/owner of Online and Pulse magazine. The billionaire real estate tycoon was an ordinary person about 15 years ago. The gentleman had a case registered against him in Aabpara Police Station for a car theft case. His brother in law, the late Zubair Mir, who was a photographer in the Frontier Post, Peshawer and very close to its owner Rehmat Shah Afridi requested Mr Afridi to help. Rehmat Shah Afridi helped him get a US visa which he used to abscond. In US he got the chance to 'facilitate' VIP's of the Musharraf regime in pleasure tourism, shopping, boozing etc. The most prominent catch was Tariq Aziz who made his return to Pakistan possible. He has not looked back since then. He was the chief wheeler dealer during the Musharraf regime who delivered half of the islamabad media to the regime. He arranged meetings of top journalists with Tariq Aziz and Musharraf. He was given the lease of islamabad's poshest cricket ground, of which he is still the president, where important newsmen, bureaucrats were served with choicest liquor and food. He used those terms to make billions in real estate, some of them the most shady deals yet to be investigated. His only journalistic credwentials were that he was the brother in law of a FP photographer ( a very good one by the way). But he now claims to be a journalists and since he is media baron other 'dogs will not eat dogs' meat.' Interestingly, he used the same real estate connections, Riaz malik of Behria Town fame, to get close to Asif Zardari. He runs a virtual mafia as he also got close to intelligenbce agencies during this time. While there is lot of attention on the online news somebody should also look into the organisation itself. How it was formed during the Musharraf regime; who funded it--it remains the biggest recepient of secret funds of the Info ministry. what would you like to say on this ? What's Billions of Dollars Between Friends? So You Want To Be A Pakistani Talk Show Host?